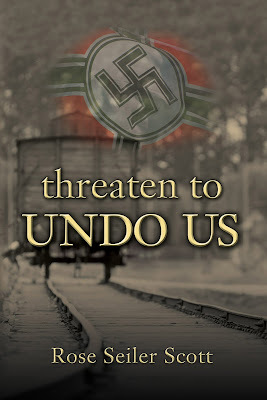 This week, we're pleased to welcome our first guest in 2016, author ROSE SEILER SCOTT with her latest release, THREATEN TO UNDO US, set during the Nazi period in Europe. Join us again on Sunday for an author interview, with more details about the story behind the story. One lucky visitor will get a free copy of Threaten to Undo Us - this giveaway is restricted to North American residents only. Be sure to leave your email address in the comments of today's post or Sunday's author interview for a chance to win. Winner(s) are contacted privately by email. Here's the blurb. Leaving her dying mother, Liesel and her four young children hope they can make it from their home in Poland across the Oder River to safety. But all that awaits them is terror and uncertainty in a brutal new regime that threatens to tear Liesel’s family apart. With her husband a prisoner of war in Russia and her children enslaved, Liesel’s desire for hearth and home is thwarted by opposing political forces, leaving her to wonder if they will ever be a family again. 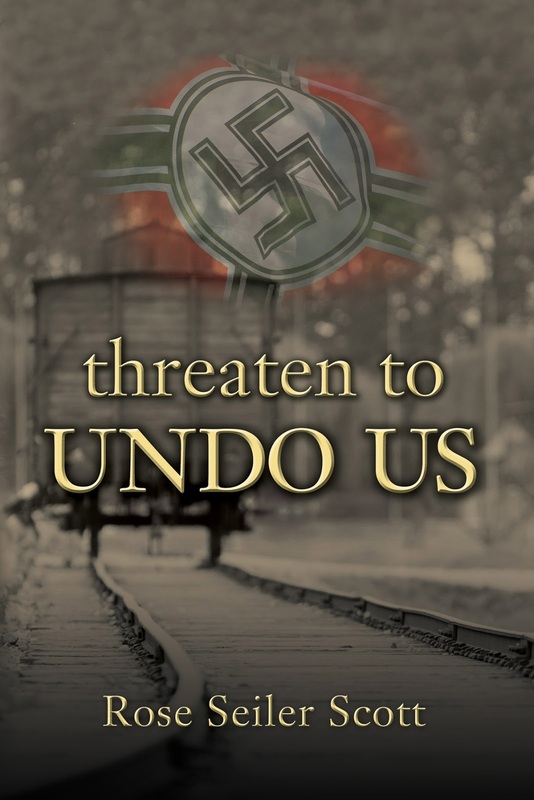 Based on a true story, Threaten to Undo Us offers a unique perspective on the Second World War, exposing historical events that took place in its enormous shadow. Ernst’s face was cast in darkness; his tall frame a shadow in the open doorway. Liesel’s eyes fluttered open and her conscious mind recalled that Ernst had left their home in Poland months ago and was missing in action, somewhere in Russia. The blackout curtains were securely in place. A single gas lamp, dimly lit, cast a soft glow on the green tiles of the Kachelofen. On the hearth ledge of the large ceramic stove, a few sticks of kindling poked out of the wood box. Above the mantel the cuckoo clock ticked softly, its pendulum swinging gently back and forth in counterpoint to Liesel’s racing heart. In the gloom, silent companions watched from the walls; Ernst in his Wehrmacht uniform and his brother attired in the black garb of the “Schutz-Staffel,” sepia silhouettes of Liesel’s parents and grandparents and a portrait of her children, taken near the beginning of the war. Kurt and Olaf stood on either side of Liesel like miniature sentinels in the matching dark suits she had made for them. Edeltraud was only a baby sitting on Liesel’s lap, wearing a perfectly tailored coat and a ruffled hat. Rudy stood next to the chair, his face turned slightly as if his attention was elsewhere. Startled, now fully awake, her heart pounded and icy fingers of terror crept over her. Reich citizens of the General Government of Poland. That meant her. Evacuate her home? With four young children? Thoughts swirling anxiously, she wondered how she would manage everything in her condition. Pulling her sweater tight against the sudden chill of the room, she heaved herself out of the rocking chair she had fallen asleep in, knocking over a half empty glass of tea in the process. Amber liquid splashed on the braided throw rug and streamed out across the floor in several directions. She felt the baby move within her. It would only be a few more weeks and she hoped for a girl, a sister for four-year-old Edeltraud. A girl wouldn’t be drafted into the army. Liesel forced herself to take a deep breath. Words she had learned long ago came to mind and she whispered them to herself. “The name of the Lord is a strong tower. The righteous run to it and are safe.” She repeated this a few times until the panic receded enough for her to think. A mental list began to take shape. She would need food, utensils, bedding, things for the baby. First she must tell the boys and enlist their help. She put on her coat and headed out to the barn. The warm smell of hay and manure enveloped her with heavy sweetness. Kaspar brushed up against her leg, meowing softly. Kurt was mucking out one of the stalls, while Olaf sat on the stool milking Wande. “Mutti? Wass is loss?” Eleven-year-old Kurt replied, his voice mirroring the tone of his mother’s. “Where are we going?” asked Kurt. Olaf, less than two years younger than his brother, patted the cow. “What about Wande and Kaspar?” His voice was brittle and his eyes glistened. In case we don’t come back. Feeding, milking, and grooming were his jobs and Liesel had observed how seriously he took these tasks. At butchering time he was scarcely to be found, unlike his older brother, who had always been fascinated by the process at an early age and was not at all bothered to wring a chicken’s neck or help pour the blood from a pig’s head.